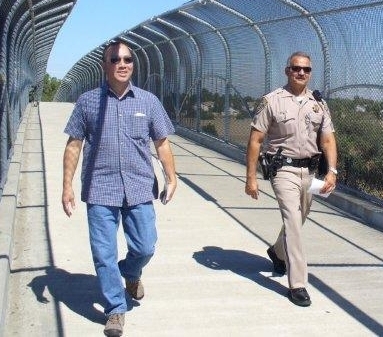 This was our first freeway blogging event after the historic meeting in February, 2010 with CHP Captain Ike Iketani in the Woodland office. In that meeting we learned how the 911 emergency call system works and how CHP uses it. Basically when people call 911 while driving through Davis on I-80 the call goes to a CHP dispatcher. If something is reported as an emergency CHP treats it as an emergency until they find out otherwise. This video shows our April, 2010 freeway blogging event with clips from the October, 2009 so you can see the contrast. We went from confrontation to cooperation. This is a model that citizens anywhere can use with your local CHP office or local P.D. We reached an agreement with CHP whereby we would notify them a few days in advance of our freeway blogging events. CHP would tell their dispatcher, the CHP officers on patrol, and the Davis P.D. of the date, time and place of our upcoming event. As a result when drivers call 911 to complain (or to report an emergency, which is ridiculous because it’s not an emergency) all of the above would know about us. They would be expecting those calls. (This is all explained elsewhere on the site – see “Clear your event with the CHP”.) The CHP may still go out to the overpass to see what is going on but they may not, and if they do they will basically know the score, know that we informed CHP before, we have done this several times before, we know the law and are doing a lawful, peaceful demonstration, and so on. They don’t go up to the overpass like gangbusters with the sole intention of shutting us down. The result, as I said in the video, is less hassle for everyone. We are able to continue our peaceful, legal demonstration and exercise our free speech that is protected by the California and U.S. Constitutions. CHP is able to check on what is actually happening with traffic (they were always able; they just refused to do it back in October, 2009) and what effect our banner is having on traffic, if any. They are able to know that we are complying with the law and to take whatever measures are really required in the (very unlikely) event that our banner is actually slowing down traffic or creating a hazard. It never does. The point is that that assessment has to be made based on the facts. When CHP is notified in advance of our plans they are able to calmly and rationally assess the facts and determine what to do. Including this event we have gone freeway blogging 8 times in Davis. The last one was March, 2012 for the “Shut Down Monsanto” weekend. In about half of those events neither CHP nor Davis P.D. has shown up. In the other they have shown up, as in this video, and we have had cordial conversations with them. In every case we were able to continue our freeway blogging with little or no hassle. This video is our masterpiece; from confrontation to cooperation with the CHP. Enjoy!